Elite Tractor Covers and UTV Covers. Covers also available for UTVs with a roll cage. Our Tractor Covers are made from the toughest woven polyester material. These covers keep your lawn tractors, UTVs or equipment protected during storage. Theses covers have fully elasticized hems to keep a snug fits around most tractors and here are vents for added breathability. Tractor Cover Approx. 3lbs. Demensions are 69" L x 39" W x 37" H with a 54" deck Suggested retail price $39.99. Our UTV Cover is designed for regular size UTV's. The material is made from the toughest woven polyester material. These covers keep your UTVs or equipment protected during storage. Theses covers have fully elasticized hems to keep a snug fits around most UTV's and here are vents for added breathability. Approx. 4lbs. Cover demensions are 108"L X 58"W X 36" H. Suggested retail price $49.99. Our UTV Cover is designed for larger UTV's that seat up to four and have a roll cage. The material is made from the toughest woven polyester material. 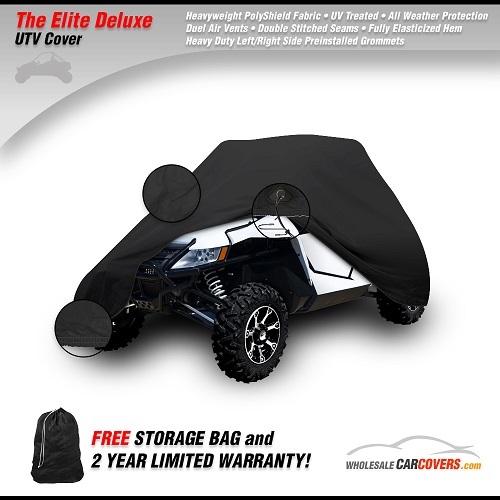 These covers keep your UTVs or equipment protected during storage. Theses covers have fully elasticized hems to keep a snug fits around most UTV's and here are vents for added breathability. Approx. 7lbs. Cover demensions 115"L x 59"W x 71"H. Suggested retail price $59.99. Our UTV Cover is designed for larger UTV's that seat up to four and have a roll cage. The material is made from the toughest woven polyester material. These covers keep your UTVs or equipment protected during storage. Theses covers have fully elasticized hems to keep a snug fits around most UTV's and here are vents for added breathability. Approx. 7lbs. Cover demensions 140"L x 59"W x 71"H. Suggested retail price $59.99. Our Deluxe UTV Cover is designed for larger UTV's that seat up to four and have a roll cage. It's heavyweight, all weather UV treated PolyShield fabric provides maximum protection against sun, rain, dirt and all type of pollutants. The cover comes with Duel Air Vents to help reduce moisture inside while helping to keep the cover in place during high winds. There is a fully elasticized hem to hrelp keep a snug fit around most UTV's. Approx. 7lbs. Cover demensions 115"L x 59"W x 71"H. Suggested retail price $99.99. Our Deluxe UTV Cover is designed for larger UTV's that seat up to four and have a extended roll cage. It's heavyweight, all weather UV treated PolyShield fabric provides maximum protection against sun, rain, dirt and all type of pollutants. The cover comes with Duel Air Vents to help reduce moisture inside while helping to keep the cover in place during high winds. There is a fully elasticized hem to hrelp keep a snug fit around most UTV's. Approx. 7lbs. Cover demensions 150"L x 59"W x 71"H. Suggested retail price $99.99.